The Deputy Secretary Ministry of Sports, Culture &amp; Heritage, Wesley K. Maritim (right) with the Kenya Motorsports Federation- Chairman, Phineas Kimathi, as they present a trophy to the Motorsports Personality of the year, Tuta Mionki. 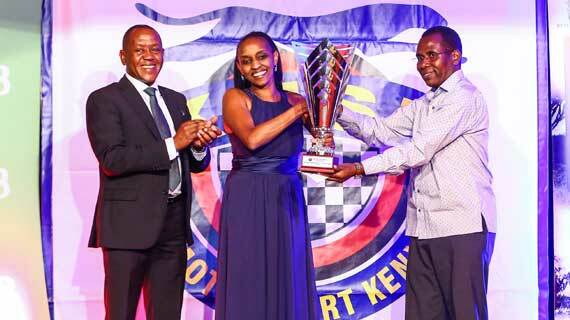 The former Two Wheel Drive Navigator Champion was rewarded for a successful season which saw her clinch the Kenya National Rally Championship (KNRC) Division 1 and Group N categories. Tuta who navigated Eric Bengi in a Subaru Impreza N12 beat two other nominees to the coveted title.The two nominees were Carl "Flash" Tundo and Tim Jessop. Tuta garnered 5 votes against Jessop's two and Flash's one in an event which saw motor clubs and KMSF commissions vote. Asked what she attributes to her season success, Tuta said: "Basically, we had a very strong team and just the fact that they helped us focus on the car and coming from a bad season in 2017 which saw us finish in only two events, we decided we want to do it a lot more meticulously and better, so we took each event at a time." The event also feted the 2018 champions in KNRC, Rally Raid, Autocross and Karting championships. Tundo and his longstanding partner Tim Jessop received their trophies for the KNRC main class and the B13 Class which allows competitors to use bigger turbo destructors and a sequential gearbox is being phased out by KMSF effective 2019. Bengi and Tuta savoured their KNRC Division 1 and group N double and so were Mombasa crew of Sohanjeet Singh Puee and Adnan Din who won Division Two and Group S.
Division III and KNRC SPV class champions were Nikhil Sachania and Alfir Khan. Sachania who is a physically challenged driver and who drives a hand controlled Evolution 10 had his trophy received by his team manager Tinu Khan as he was out of the country. Two Wheel Drive champions were Sarit Shah (drivers) and Wayne Fernandes (navigators). The overall Raid champions were Ross Field and Quentin Savage who also won the Motorcar-Prototype class. The Motorcar-Modified class honors went to Adin Haq and Kavit J. Dave while the Buggy was taken by Abid Ganatra and Sameer Mohammed. The Kenya National Autocross Champions were Safina Khan (2WD Non Turbo), Inran Hakada (2WD Turbo), Sahib Omar (4WD Turbo): Kirit Rajput and his son Yuvraj Rajput won the Open and bambino classes respectively. Kenya National Karting Champions were Zack McKean in 60cc Class Comer, Yuvraj Rajput in Iame Class, William Kim in Junior Rotax Class, Yash Gohil in Rotax Mini Max Class and Neel Vadgama in Open class. KCB Group Marketing and Communications Director Angela Mwirigi noted that after a solid 16 years of the rally sport support they are proud as a Group to continue supporting various disciplines of motors sports and sports in general. "In the next three years we will be supporting motorsports and look forward to a very strong partnership with KMSF," said Angela. KCB are expected to announce their return to the title sponsorship of the 2019 KNRC in due course. KMSF Chairman and WRC Safari Project CEO Phineas Kimathi said 2019 will be an eventful year what with the WRC Safari candidature in July. He said Clubs will now receive an improved facilitation of the KNRC sponsorship while KMSF will take over the provision of the safety chopper. Kimathi added that homologation of cars for African countries has been extended by FIA from four to eight years meaning teams will not have to invest on new machines when the four year duration ends. Kimathi added that the first round of the KNRC will be held on the first week of February. 1970-Joginder & Vic Preston Jnr.